How Much is Garage Door Opener Installation? Labor cost can vary from $120 to $300 depending on where you live and how difficult the installation is. If you are looking to purchase a new garage door opener online, we recommend the Chamberlain B970 Smartphone-Controlled garage door opener featured below. Yes, you can definitely install a new garage door opener yourself. Chamberlain garage door openers are easy to assemble and include step by step directions along with excellent support videos found here. If you get in a bind, you can call customer support and they will guide you through the problem and help with programming limits, remotes, and keypads. We recommend the Chamberlain B970 Wi-Fi Smartphone Controlled Garage Door Opener that includes 2 remotes, 1 outside keypad, and smartphone control. For proper installation, use heavy duty National Slotted Angle to mount the opener to the ceiling. This will ensure a safe and secure installation. If your garage door is over seven feet tall, you will need the 8ft Chamberlain rail extension kit. This extension kit is offered by Chamberlain and includes a longer rail and drive belt. This will allow you to install a Chamberlain opener on garage doors over seven feet tall. What Parts Do I Need to Install My Garage Door Opener? Chamberlain garage door openers come with everything you need for installation but there are a few extra things that will be needed and a few that are recommended. The first thing you will need is a garage door opener light bulb. You can use any regular bulb, but most will burn out prematurely meaning you will always be replacing bulbs. Standard hanging brackets come in the box but they are very thin and flimsy. We recommend National Slotted Angle to secure the garage door opener to the ceiling. This will provide a secure installation that won’t fail in a few years. If you have a steel back insulated garage door, you want to make sure you are using an opener reinforcement bracket when connecting your garage door opener pickup arm to the door. This will ensure the proper connection with an insulated door. Steel back insulated garage doors have a third layer of metal on the inside of the door covering up the insulation. This is how you identify a steel back door. Most Chamberlain garage door openers come with one or two remotes. If you need more, try the Chamberlain 953EV remote that works on all Chamberlain, LiftMaster, and Craftsman garage door openers manufactured after 1993. The Chamberlain Clicker universal remote works with additional brands such as Genie, Overhead Door, Linear, Stanley, and Wayne Dalton. It will also allow you to program different brands of garage door openers to each button. What’s Included with Professional Garage Door Opener Installation? Anything above and beyond this might be an additional charge. This is why it’s important to discuss everything with your installer before they proceed. For instance, you might want them to program your vehicles to your garage door opener or tune up your garage doors while they are on location… lubrication, adjustments, etc.. Good communication can be a great start to a lasting relationship with a servicing company. If you are paying labor only for installation, you will need to purchase a garage door opener. We recommend the Chamberlain B970 Wi-Fi Smartphone Controlled Garage Door Opener due to its legendary reliability and many great features. Smartphone capabilities allow you to monitor and control your garage door opener from anywhere in the world. Parts are available for Chamberlain openers at any LiftMaster dealer or online ensuring you will always be able to get service and accessories. Be careful when hiring your local home center to install your garage door opener. Many times they use third party companies for installation services that will try to up-sell you once they are at your home to perform the installation. The price seems great at first, but the next thing you know your needing all sorts of new parts for your garage door that may not be necessary. Home centers don’t pay garage door companies very much to install automatic openers and doors. To make up for this loss in profit, they will sell add ons. Its best to try and find a local garage door company in your area that has been in business for at least 10 years. They will most likely be around when you need warranty or additional services in the future. How Much If the Garage Door Company Provides the Opener? If you are going to have a garage door company provide the opener, request a LiftMaster or Linear garage door opener. These units usually cost anywhere from $400-$600 installed with parts and labor. Pricing will vary depending on where you live, what company you use, and whether or not you go with a belt or chain drive model. 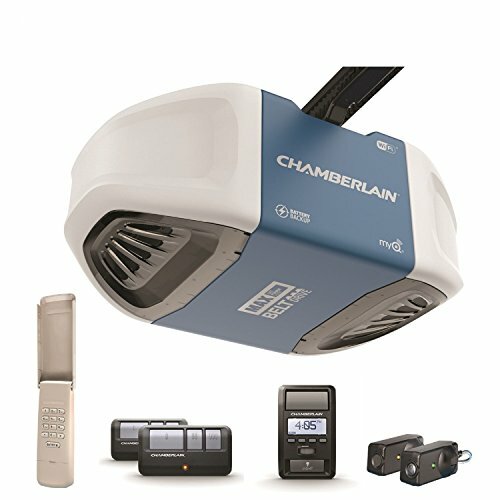 LiftMaster is the professional version of Chamberlain and they are both made by the Chamberlain Group who also makes garage door openers for Sears Craftsman. The main difference is in the rail that comes with the unit. LiftMaster uses a one piece rail while Chamberlain uses a multi-piece rail so it fits in the box you take home from the store. All belt drive models use the same drive belt while Chamberlain and Craftsman chain drive models use a cable and chain system as compared to the full chain used on a LiftMaster. Linear is another professional brand that most people don’t know about. They make a good product like LiftMaster and Chamberlain that is reliable and has great parts support with a strong distributor and dealer network. Stay away from Genie, Marantec, and Guardian. These brands have many issues and parts can be tough to find for certain models. Do Installers Run Wires in the Walls and Attic? Most garage door companies DO NOT run wall button and safety sensor wires in the walls and attic. This is usually a job done by a licensed electrician that is certified to run wires inside the wall of a residential home. Due to cross blocking between studs in the wall, special drill bits are required to complete the job after sheetrock has been installed. It is a very time consuming job that can be expensive when you include drywall repair that is needed once the electrician is finished. A garage door installer can run the wires in a way that is pleasing to the eye. The wire that comes in the box is a neutral color that blends in great with most ceilings. Running the wires tight up against the ceiling with plenty of staples will be pleasing to the eye and hold up well for years to come. Do Installers Program Remotes to Vehicles? Some companies will program garage door remotes to your vehicle as a courtesy and others will charge a fee. Many years back it was a lot more simple to program garage door openers to vehicles because there was only one system in all vehicles... HomeLink. Today, there are several different types of systems used in vehicles for garage door openers and some require a repeater kit for it to program properly. A repeater kit is a part that can be purchased from the manufacturer of the garage door opener system that is installed in your vehicle. Your vehicle owners manual will usually tell you the brand of garage door opener buttons that were used in your vehicle. HomeLink and Lear Car2U are the two most popular. Do Installers Use Heavy Duty Mounting Brackets? The hanging brackets that come in the box for most garage door openers are very cheap. Genie uses a thin strap metal and Chamberlain/Sears Craftsman openers use a thin angle that is hard to work with. This thin metal has been known to fail over time due to vibration of the motor head. We recommend the National Slotted Angle which is heavy duty and won’t fail in a few years. This will provide a secure, long term connection with the ceiling that is needed when opening a garage door everyday. Most reputable garage door companies will be using heavier gauge slotted angle for the installation. This heavier angle will hold up over time and won’t fail like the thin stuff that comes in the box. If the drop from the ceiling is more than 8 inches, a diagonal sway brace should be installed to prevent movement and cut down on vibration. How Much to Shorten a Garage Door Opener Rail? If you have a beam or obstacle running through your garage that is prohibiting the installation of a garage door opener, you will need to have the rail and drive chain shortened. A garage door company will charge an additional $40-$80 for this service on top of the price of standard installation. A standard opener for a seven foot high garage door usually needs around 124 inches of room from the header to the back of the motor housing. A seasoned installer will spend anywhere from 30 minutes to 1 hour shortening a garage door opener rail. The reason for this is because the rail needs to be cut down. The chain and/or cable has to be shortened as well and the header bracket needs to be reattached to the rail with the existing bolts. This can be very time consuming with certain models of garage door openers because they all have different drive rails. Keep in mind that anytime you shorten the rail of a garage door opener, you are limiting how far it will open your garage door. This usually means the door will not fully open and the bottom section will hang below the header. Many people are okay with this if they have a small car and don’t need the door to open all the way. They are just happy to have an automatic garage door opener. How Much to Install a Wall Mount Garage Door Opener? 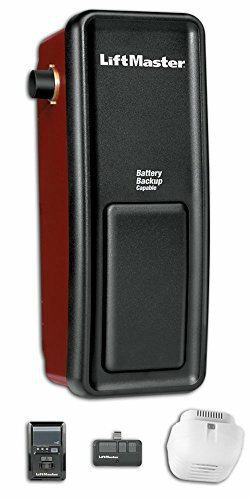 A wall mount garage door opener such as the LiftMaster 8500 will cost $200-$300 in labor for installation. The installation of this opener is a lot more involved due to the cable tension monitor system and electronic dead bolt that needs to be installed. Standard installation for a wall mount garage door opener takes around 3 hours. One thing to keep in mind is you will need a power outlet by the garage door vertical tracks since this opener mounts on the end of the torsion shaft that runs above the garage door. The wall button and safety sensor wires should be ran in wall to this same location. It is not absolutely necessary, but it will provide a much cleaner look if they are. When calling around to get quotes for opener Installation, many garage door companies will ask if the box has been opened. Do not open the box if you want a professional company to install the garage door opener you purchased. The reason for this is so they can assure all parts needed will be there for the installation. There have been many instances where an installer is half way through assembling a garage door opener to find out a part is missing. The installation can’t be completed if a part is missing and a second appointment will have to be scheduled. Keeping the box sealed will prevent any wasted time and additional service call charges. Which Garage Door Opener Do You Recommend? We recommend the Chamberlain B970 Wi-Fi Smartphone Controlled Garage Door Opener. This opener features an ultra quiet belt drive system with Chamberlains Motor Vibration Isolation System. This ensures years of quiet, smooth operation which is great if you have a bedroom or nursery near the garage. Included in the box is 2 vehicle remotes, 1 outside keypad, a multi-function wall control panel, and safety sensors. MyQ enabled Wi-Fi technology allows you to use your smartphone to monitor and control your garage door opener with no monthly fees and a free smartphone app is included.